Unfortunately I haven’t had much to report lately as i haven’t, well: A. been myself; and B. had funds for finding new tea. But this week I encountered a few things (at Busch’s) I hadn’t tried/hadn’t had in forever that I thought would be fun to report on. High Country is an appropriately named, hitherto totally unknown, USDA organic NON-GMO bottled ultimate probiotic (non-laboratory produced) kombucha tea. They apparently have several different flavors including a root-beer inspired one (kinda hard to pass that one up). Today I’m drinking their Elderberry Hibiscus kombucha and to be honest, it resembles a lambic beer more so than anything else. After opening and letting it utterly foam out (was not at all shaken and totally refrigerated), i took one taste and about all but fell over, and I’m pretty such the words “OH… MY… GOD!” could be heard uttered. It’s easily the most wildly yeasted tea I’ve ever had. It’s somewhat difficult to drink it without making some sort of negative facial reaction to the viscosity of the beverage and flicking your tongue off the roof of your mouth from its tartness. There’s a definite floral aspect to both the taste and the aftertaste (the variation between them being terrific), though i’d be hard pressed to identify it as either belonging to elderberry (we don’t have much of this where I’m from) or hibiscus. Also, i belched fully after about four or five swigs. In truth, the closest thing I’ve ever tasted to this kombucha is Jolly Pumpkin’s Lambicus Dexterious. I feel like calling Elderberry Hibiscus a kombucha doesn’t do as decent a job of describing the essence of the drink as might “lambic almost completely non-alcoholic beer”. 100% recommended! I give major props to High Country for knocking my metaphoric socks off. 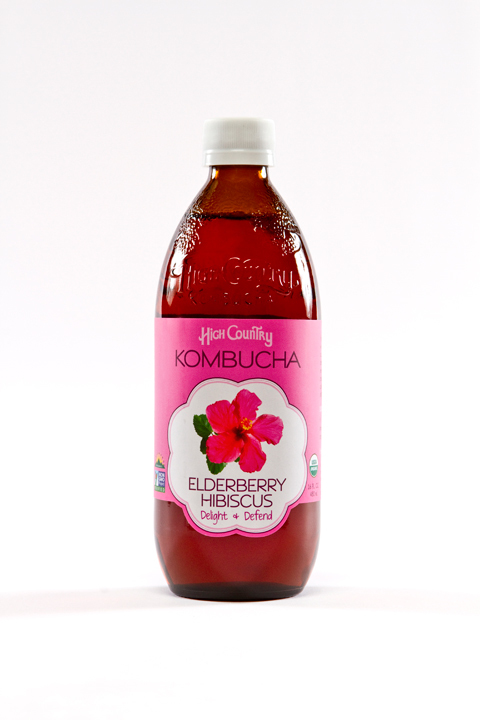 If you happen to be a fan of either kombucha or lambic beers, you simply must try High Country Elderberry Hibiscus.